You’ll see this fried rice recipe come up every few months in Nourish Weekly Menus, always in a different guise. Sometimes with cabbage, sometimes with bok choy, sometimes with shredded pork, sometimes with spicy shrimp … you get the picture. Feel free to use add basic recipe to your rotation with anything calling from your fridge. 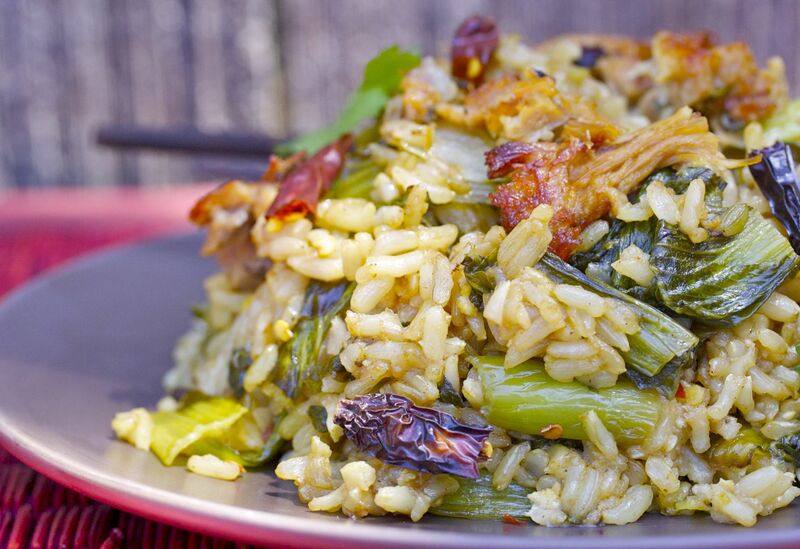 It’s a great way to use up leftover rice, veggies — whatever you have on hand. Whisk broth, water, oyster sauce, soy sauce, vinegar, chile paste and cornstarch together in small bowl, and set aside. Heat 1/2 tablespoon oil in a large wok or nonstick skillet over high heat. Add cabbage and a pinch of salt. and saute for 5 minutes, until wilted and charred. Remove to a plate. Swirl in remaining 1-1/2 tablespoons oil and saute onion for 3 minutes, until softened. Add garlic and cook another 30 seconds, until fragrant. Add rice and stir-fry 2 minutes, until softened and separated. Push to one side of pan and pour in egg. Let egg set for 30 seconds and then chop coarsely with spatula. Stir in meat, veggies, cabbage and peas and toss everything together to combine. Give sauce a stir to mix and pour into pan. Toss rice to coat. Cook 5 minutes longer or until heated through. Spoon onto serving dish or into bowls. Sprinkle cilantro over top and season to taste with additional soy sauce.